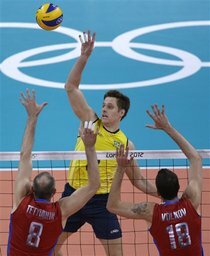 LONDON (AP) Dimitriy Muserskiy and Russia managed to stay alive long enough to wear out Brazil. Muserskiy had 31 points and the Russians won their first men's volleyball gold in 32 years by rallying for a five-set victory in Sunday's final at the London Olympics. Brazil had two chances at match point in the third set, but Russia marched back for a 19-25, 20-25, 29-27, 25-22, 15-9 victory. Volleyball has always enjoyed a high profile since its entry into the Olympics at the 1964 Games. Since then, side-out scoring has evolved into rally-style point building, and the introduction of the libero to the back row has helped keep the game as fresh as it is fast-paced. At Earls Court, a sport that has hit full stride will be on display with no shortage of global contenders for gold. Take a look and see how a sport more than a century old has stayed current and maintained its popularity. Volleyball Events for the 2012 London Games have been completed.